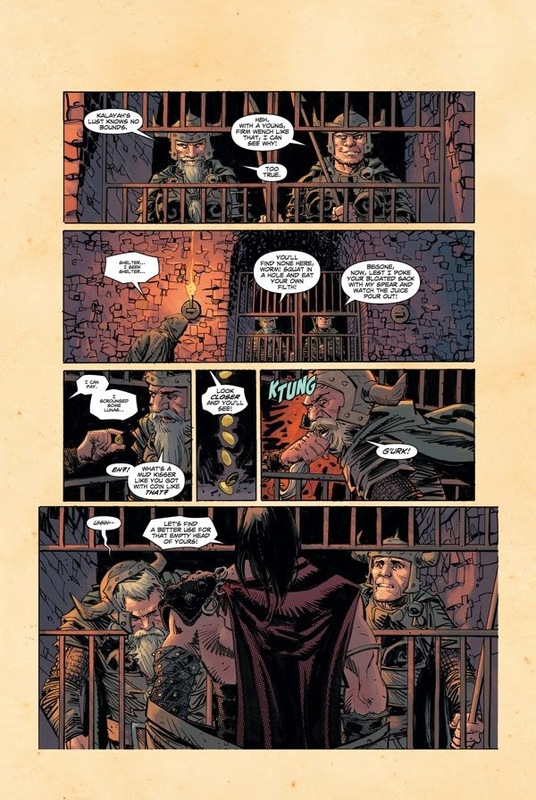 Two thieves in the night share a common target, using their own unique skills to co-capture a prize, then refuse to give it up in this start to a four-part crossover that was everything I'd hoped it could be. 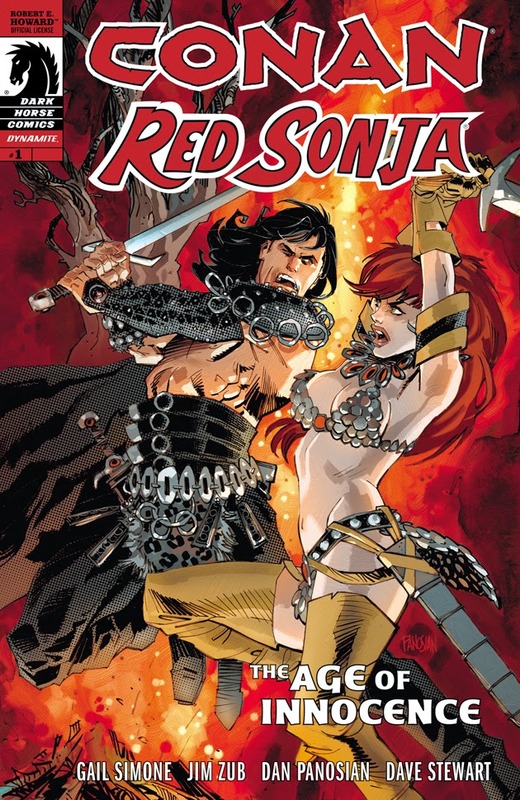 Those of you who followed along with my Newsarama reviews know that I really dig Gail's take on Red Sonja. You also know, from both the Best Shots team and my own posts here that I am also a big fan of Jim Zub. So it wasn't going to be much of a stretch for me to like this one, which does everything both creators are good at--and whether or not you like this comic probably will be heavily based on your opinion of their writing styles. Opening with a mysterious wizard (never a good guy, in the world of Robert E. Howard), the scene quickly shifts to an in-disguise Sonja, who takes care of an odious figure with some fancy moves and an acid-tongue. Meanwhile, Conan also uses guile to gain entry. The two meet, trade amazing verbal barbs, and form a partnership of mutual respect, a bit of distrust, and a common hatred for anything a wizard wants to do. It's a perfect way to show that Conan and Sonja are two sides of the same coin, operating differently and yet sharing a commonality of character--Howard's moral center--that makes them so engaging. Zub and Simone understand that while neither Conan nor Sonja are angels, they have an outlook on life--particularly life in Howard's Sword and Sorcery world--that make them compelling. When creators try to run away from this, the characters don't work. By going headlong for the essence of Conan and Sonja, the writing team deliver exactly what those of us who've read and re-read just about everything produced for these characters need from them. The quality is not in "How do I make my Conan different?" but in "How can I take what works and bring my own take to it?" For example, besides their plotting chops, one of the signature stamps from Jim and Gail is giving both characters very good quips to banter with. Best of all, I can't tell who is writing which section. There's no clear demarcations or jarring narrative shifts. It's a very well-done collaboration, given the two have (at least to my knowledge) never written together before. Dan Pinosian is new to me, but he really does a great job with this one. He could probably have put a bit more strength and scarring into Sonja's depiction, but I like that this is a world that feels like it stepped out of a Roy Thomas/John Buscema collaboration, not some godawful, over-processed thing with every line smooth as a baby's bottom. There's a rough, angular feel to his linework, which Dave Stewart expertly enhances with coloring that plays off a mixture of purple and pink dulled with other shades--a nice change from the muddied browns that kinda turned me off Stewart over time. 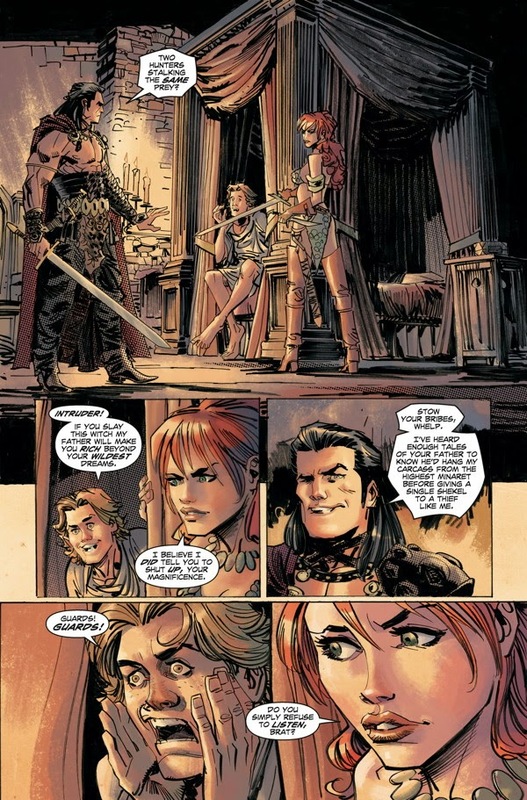 Pinosian's facial expressions, especially for Conan and Sonja, give the cutting remarks from Simone and Zub an extra bite, too. Is there anything more fun than a grinning Cimmerian? I also thought the general layouts worked really well. There's very little posing, and the decisions on what to depict and how we come across certain characters when we see them bring a lot of the story to the reader in just the visuals. That's especially important at the beginning and end, for the framing device. Pinosian even makes sure that when character faces are barely seen due to the scale of the panel, we can still make out how each person is feeling. Little things like showing Conan in motion jumping over guards or the dismissive eyes of Sonja as she takes what she thinks is a last look at Conan really take this from "That's good" to "That's great!" territory. It's not really shocking to me that I enjoyed this crossover. I will say, I didn't expect to like it this much. But when you write a story that moves quickly yet makes you want to linger over the details, create a one-and-done that's also part of a longer arc, and make me really feel like you understand Howard's essence as a writer, you're getting spotlighted for your work. This is what I'd like to see more writers do with classic properties, and it's a joy to watch when two of my favorite characters get such a great, highly recommended, treatment. I can't wait to see what issue two brings!